When you jump in a pool, it’s breaking the surface that requires the most force; once submerged, it’s easier to plunge deeper. This effect has to do with the way liquid molecules attract each other. Those on top have neighbors only on one side and cling all the more tenaciously to them, forming a kind of skin. On a waterproof surface, rain will run in droplets, with all the outside molecules drawn inward. Soap reduces the surface tension of water so it gets into clothes, hair, and other textured things by essentially coating the water molecules and making them more slippery. One end of the soap molecule is drawn to water molecules, while the other end repels water. Every year hundreds of thousands Muslims converge on Mecca to perform the Hajji, the pilgrimage that is a duty of their faith. Designed to host this influx, the Hajji Terminal at Saudi Arabia.s King Abdulaziz International Airport is s strikingly modern, open air tent village covering 120 acres. Most buildings hold their structure up by the weight of things pushed together stacked bricks and joists, for example. But the Hajji Terminal relies instead on tension , the force created when things are pulled apart. In the roofs of the Hajji Terminal, vast swathes of lightweight, flexible, Teflon coated fiberglass fabric are suspended in cone shapes on taut steel cables. 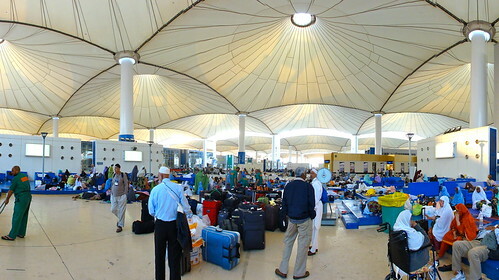 This Terminal was built to accommodate the pilgrims on their way to Mecca during the holy month. Up to 100,000 people pass through it in one day. The fabric roof covers 430,000 sq.m. of plan area which is by far the largest roof structure in the world. Made of Teflon coated fiberglass the roof reflects most of the heat. Acting like a forest in the desert it provides comfort without requiring mechanical energy. The roof consists of 10 modules of 320m by 138m, each having 21 tentlike units. Their peaks are suspended from steel pylons leaving the space under the units wide open. Cost of the roof structure: $ 180 million. Roof Design Consultant and Structural Engineer : Geiger Berger Associates. Horst Berger, Principal-in-charge.